Jaundice causes yellowish tinge to the skin as also the white part of the eyes (sclerae). The body fluids may also get yellow. The disease is caused by an excess of bilirubin in the liver. The Jaundice Meter uses light to determine if the infant has jaundice. It measures the transcutaneious bilirubin value relating to serum. It eliminates the necessity of blood sampling. The procedure is not only painless but safe also. The Jaundice Meters, produced by the most reliable manufacturers & exporters, GPC Medical Limited, are easy to operate, and they show accurate result instantly. 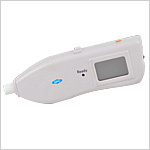 Send Your Buy Requirement For "Jaundice Meter" AND Get Quote Quickly.